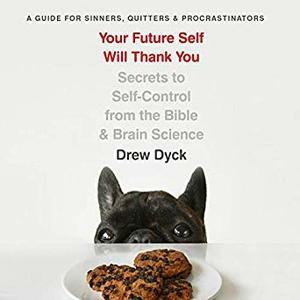 Drew Dyck, Wes Bleed (Narrator), "Your Future Self Will Thank You: Secrets to Self-Control from the Bible and Brain Science (A Guide for Sinners, Quitters, and Procrastinators)"
Admittedly, self-control may be the least-coveted fruit of the Spirit. But the truth is that people who are successful at self-control have freer, happier lives, and we all want that. After all, our bad habits - from the slight to the serious - bring with them a host of negative emotions, take up our time, and keep us from being the best version of ourselves. Sure, self-control is hard, but it doesn't have to be that hard. Your Future Self Will Thank You is a compassionate and humorous guide to reclaiming your willpower based on the Bible and brain science. It shares proven, practical strategies for success, as well as biblical principles that will help you along the way. Whether you want to lose a few pounds, conquer addiction, or kick your nail-biting habit, this book will help you get motivated, stay motivated, and achieve your goals. Get the help you need to be freer, happier, and more successful. Your future self will thank you!